‘Chi-ho’ whose only virtue is being irresistibly attractive. ‘Dong-woo’ who is torn between his dream and the family. ‘Gyeong-jae’ who only has a brain for study. A super-charming slacker who pursues a life of doing nothing after high school; a re-taker who works hard for his dream of becoming a cartoon artist despite the financial hardships; a college freshman whose college activities are entirely geared toward attaining his ultimate goal of landing a job in a global corporation… A radiant comedy about three best buddies who turn twenty to share the most embarrassing moment of their lives! So what is it like to be 20? Or back to 20 years old, for those who are already above 21. I guess the guys will be able to relate more with this film as it provides an exaggerated and humorous perspective of the guys who struggled (openly) to find their directions in life. 2PM’s Lee Jun Ho acted as Dong-woo, a student who repeat his final year so that he have more time to pursue his artist dream while earning for his college fees. He’s perhaps the character I was able to relate with the most, especially when he said that he did not want to give up his dream now, as he’s afraid he might not have the courage to pick it up again next time. I had the same sentiments, as despite having many notions of giving up my acting dream, I was afraid to let go, because I might regret it in future. It was love for Soo Hee (Lee Yoo Bin, Pinocchio) which made him changed his plans and work towards money instead of pursuing his dreams. Kang Ha-neul’s “Gyeong-jae” represents majority of us, moving on to college despite not knowing exactly what he should do. As the narrator of the film, this young Bae Yong-joon lookalike is most probably the quintessential guy most girls will fall over. Smart, decent and Mr-Nice, but that doesn’t include the time when he’s drunk! After catching Kim Woo Bin’s The Con Artist just 2 months ago, I was curious what will this intelligent con-man turn into when he’s back to becoming a student. While he’s the most hilarious and bold person amongst the three musketeers, he’s my least favourite character. Aimless, reckless and playful. Yet, he’s the epitome of the playful kid in most man. How many guys will dream of groping a girl, getting off and her becoming his girlfriend! I love the chemistry between the three guys. It realistically captures the sentiments of the youths nowadays, at the same time, bring out the brotherhood (as well as jealousy) of brothers being together with their best friend’s ex or sister! Interestingly, the three guys represent different sides of me. Dong-woo is my current self, where I’m striving to pursue my dreams. Gyeong-jae was my past, when I was doing what most people do, taking the practical path, getting into university, finding a boyfriend and moving on. Chi Hoo is someone whom I don’t think I can ever be, or someone I dread becoming, to be doing nothing in life, having no purpose in life. If you love Quick Silver’s slow-mo scene in “X-Men:Days of Future Past”, you will find the trio’s fight scene with the gangster hilarious. The exaggerated slo-mo filming was so crazy that practically everyone were laughing their heads off. I was very much amused by this film, and it definitely reminds me of what my sister told me when I was “advising” her about her future. “Not everyone knew what he/she want to do like you(me).” And “Twenty” is the very film that expressed this fact, which hopefully, will be able to aspire the young KPop fans to search and work towards their goals before it’s time to face the harsh reality of the working society! Director Lee Byeong-hun had worked on the adaptation of screenplays for “Scandal Makers”, “Sunny” and “Tazza: The Hidden Card”, the movies hailed for their witty dialogues. He proved his potentials as a director in the independent film, “Cheer up, Mr. Lee”. “Twenty” is his feature directorial debut. “Reply 1994” actor Yoo Yeon-Seok was offered a co-lead male role in the movie, but declined due to scheduling issues. Check out TWENTY 스물 (疯狂20) Facebook Page! 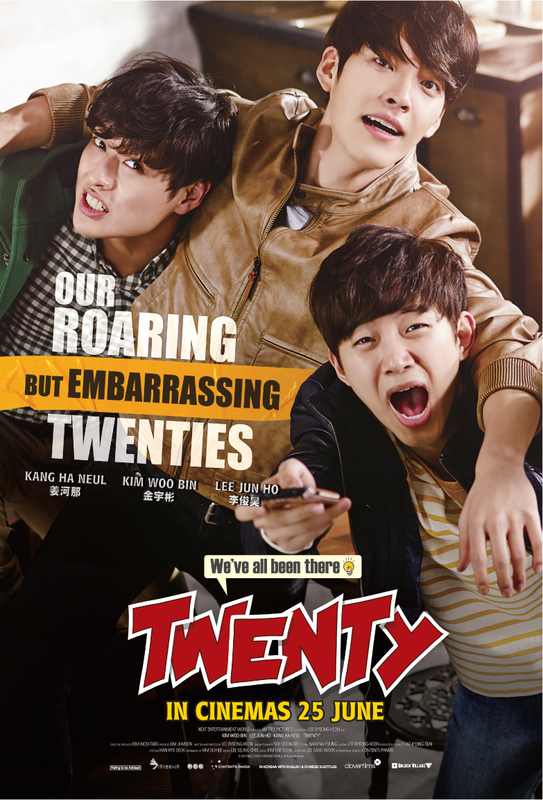 TWENTY 스물 (疯狂20) is out in cinemas on 25 June 2015. This looks like an interesting movie. Does this come with english subtitles? Korean actors are too pretty and flawless. The storyline is norm not too many new sentiments. It would be quite pleasant entertaining. This sounds like a great film, love that its based on friendships and comedy. A feel good film. I love a good comedy and this is right up my alley. I wonder if I can ever get to see it here in the US. I’m most definitely going to try and look it up. It looks like a fun movie about friendship and their misadventures. It would be nice to watch this one. I will watch this, its a comedy! Hope they can put English Subtitle so that Philippine viewers can also understand it. There’s English Subtitles, or Singaporeans won’t be able to understand it too! The golden age of twenty, when everything is a possibility! I think I don;t miss my twenties much, honestly – except for those endless energies! Oh cool. I am into korean invasion now a days. I am inlove with the characters for sure. I will add this to my need to watch list. Not a fan of Korean drama/movie. So I didn’t pay any attention on whether this is showing in Malaysia too. Anyway, thanks for sharing. This looks like it is pretty funny. Yeah being in your twenties is a rough and confusing time, so I’m glad there is a movie about it :). 20 is the age where you’re officially no longer a teen. Personally, I find that age the hardest to deal with because I was very worried with what my life would become, how I won’t disappoint my parents, the peer pressure, etc. It felt hard but realizing it now made me smile. It was also fun and exciting like the movie. Many experiences that I will forever treasure. This sounds like a nice comedy. My husband like watching this type of film.